Posted in: Announcments. Tagged: Awards. Yes, that’s right, Ubar Grotto has won another award! 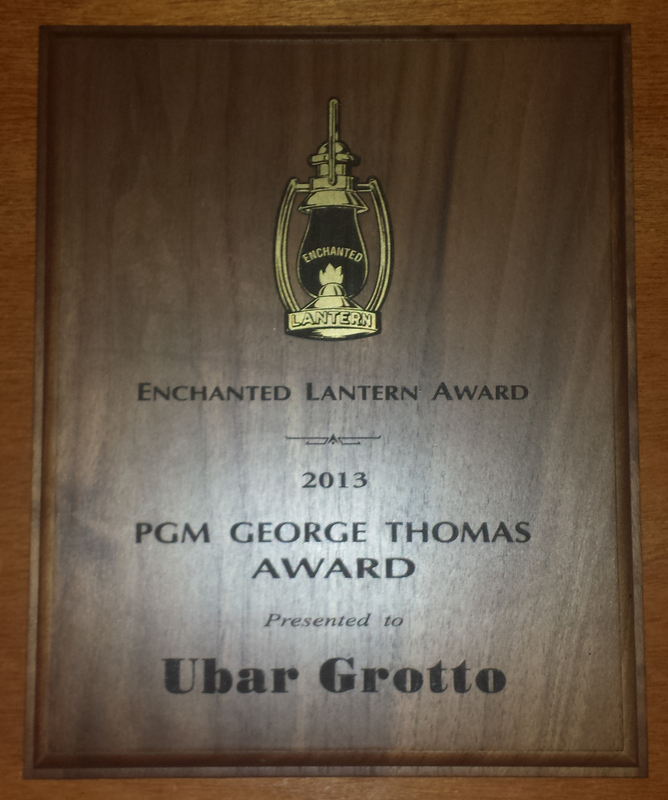 The Past Grand Monarch George Thomas award was awarded to Ubar Grotto for the highest total number of Enchanted Lanterns that were contributed by an individual Grotto, under the membership of 100. This means that Ubar Prophets purchased more Enchanted Lanterns than any other Grotto under 100 members from June of 2013 to April of 2014. Nailed it! The award, named in honor of Past Grand Monarch George Thomas, recognizes the person who introduced the Dental Program to the Grottoes of North America. He was a practicing dentist who treated special needs people and brought to the Grotto the fact that they were the most under treated population. Thus, the Supreme Council adopted Dental Care for Children with Special Needs as their main charity in the 1960’s. “Doc” Thomas, as he was known, was a member of Samis Grotto in Richmond, Virginia. He has since passed away, but his family is still a part of Samis Grotto and several Ubarians were excited to spend time with his family last year when they visited Richmond. Thank you to each of the Prophets who purchased a Lantern and made this award a reality! A toast!